The history of oregano begins in ancient Greece. The word “oregano” is derived from two Greek words, “oros” (mountain) and “ganos” (joy), giving it the meaning of “joy of the mountain.” It is believed that Aphrodite, the goddess of love and beauty, created oregano as a symbol for happiness and joy. She grew the herb in her garden on Mount Olympus. The ancient Greeks crowned newly married couples with garlands of oregano as a blessing of happiness upon their marriage. They also planted oregano around their houses to ward off negative energy, and wore wreaths of oregano on their heads to sleep to encourage pleasant dreams. The Romans later adopted oregano, and it then spread to the rest of Europe, China, and northern Africa, where it impacted and shaped many of these countries’ cuisines. In Greece, this fragrant herb can be found all over the countryside. It grows abundantly on Mt. Taygetos (just outside of Kalamata), the highest mountain in Lakonía, Greece. This is my favorite oregano, and the variety I use in all my cooking. Some of my fondest memories with oregano are of gathering it fresh and drying it on our rooftops in Greece. Once dry, we would rub it on towels to extract the flowers from the branches, then store it in glass containers for later use. Perhaps we should not be surprised that oregano was believed to bring happiness; after all, it seems to cure almost everything. Since ancient times in Greece, herbs have been used both as a food and a source of healing. As a food, they were a main staple alongside fruit and vegetables, and were preferred over meat and milk. 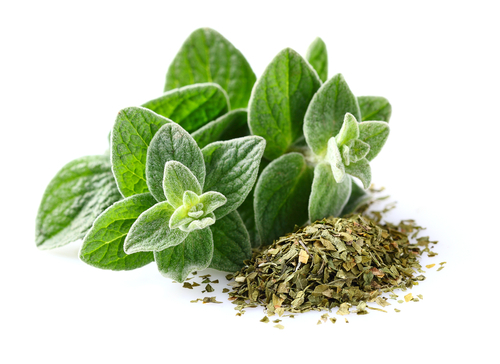 The ancient Greeks were also the first to realize the amazing healing properties of oregano. Hippocrates, who penned, “Let food be your medicine, and medicine be your food,” recommended the use of a lot of aromatic herbs in cooking to satisfy hunger with just a little food and prevent overeating. Hippocrates also used oregano oil to treat cuts, skin infections, psoriasis, and stomachaches. Oregano oil has antibiotic and antioxidant properties, and in ancient Greece was brewed as a tea with honey to treat coughs, colds, and asthma. Its juice, meanwhile, was used to cure tonsillitis and mouth ulcers. Greek oregano oil is considered the best in the world, and studies have shown that it contains high concentrations of carvacrol and thymol, both of which have powerful antioxidant and cancer-fighting properties. In “The Green Pharmacy,” ethnobotanist James Duke says oregano contains at least seven compounds that can lower blood pressure, and more. Oregano is the heart and soul of Greek cuisine. Most herb lovers will agree that wild Greek oregano is the most flavorful, and arguably the best, oregano in the world. Its leaves contain more oil glands than ordinary oregano, giving it the potent and pungent flavor of the Mediterranean. It is believed that goat and lamb meat from Greece tastes so good because the animals often forage on oregano growing wild in the mountains. Oregano has a wonderful flavor, but too much can be overwhelming, so less is more. Dried oregano is more concentrated in flavor than fresh (water in the leaves dilutes the oils), so use it sparingly. As the most commonly used herb in Greek cuisine, oregano is added to soups, stews, meat, seafood, and baked goods. It especially shines in dishes like slow-cooked lamb, souvlaki, meatballs, and plakous (Greek pizza). No horiatiki (Greek salad) worth its salt is without oregano; and the quintessential, all-purpose Greek dressing ladolemono (meaning “oil and lemon”) is made with lemon juice, olive oil, and dried oregano. The applications of this beloved herb are virtually endless. In your next dish, bring out your inner joyous god or goddess with a sprinkling of oregano. It is best to purchase oregano on the branch, rather than in jars. The easiest way to preserve oregano is to dry it. Spread the stems on paper towel-lined baking trays, and set the trays in a well-ventilated room away from direct sunlight. As soon as the leaves become brittle, put them in jars, seal tightly, and store them away from light and heat. (It’s best not to store them near the oven.) When stored this way, oregano will keep for one to two years before it starts to lose its flavor. Place the oregano in a mug or teapot. Pour the boiling water over the herbs and cover with a lid. Let steep for five to 10 minutes. Strain before drinking and serve with honey. This no-fuss dish is the way I like to cook my fish. The parchment paper ensures that all the wonderful flavors are retained, and the fish is juicy and not dry. Ladolemono pairs perfectly with fish. You can substitute cod for halibut or salmon. Place the slices of potato in the center of each of four 13-inch squares of parchment paper. Season with sea salt and cracked pepper. Place the greens on top of the potato slices. Place the fillet of fish on top of the potato and greens, and season with sea salt and cracked pepper. Scatter the garlic, green onion, parsley, and dill on top of the fish. Place the ingredients for the ladolemono in a bowl and beat with a fork to combine well. Alternatively, place all the ingredients into a jar with a tight-fitting lid. Seal and shake until well blended. Drizzle the ladolemono on top of the fish. Lift the opposite sides of the parchment paper to meet in the middle, above the fish. Tightly fold down the paper until it touches the fish, crimping to seal. Roll up and crimp the ends to seal. Be sure the paper is sealed snugly so that steam won’t escape during cooking. Place the fish parcels on a rimmed baking sheet and bake for 20–25 minutes, until the fish is cooked through. Let the fish parcels rest for five minutes and serve while still hot. Maria Benardis is a Gourmand Award-winning author, chef, motivational speaker, intuitive health and wellness coach, and founder of Greekalicious.